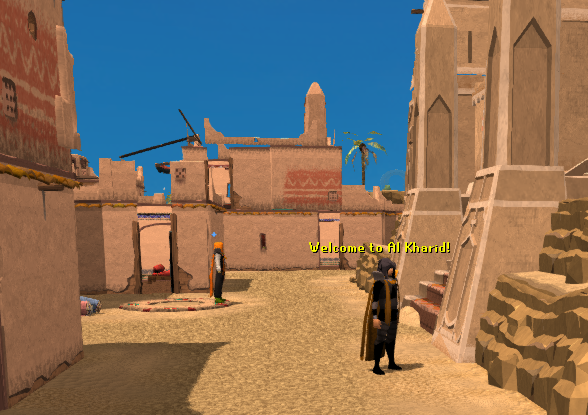 Al Kharid is the only free-play desert town in RuneScape. 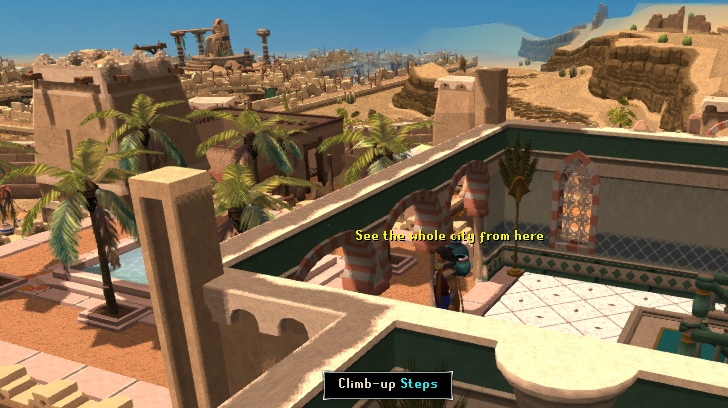 You can find this great desert city south-east of Lumbridge. 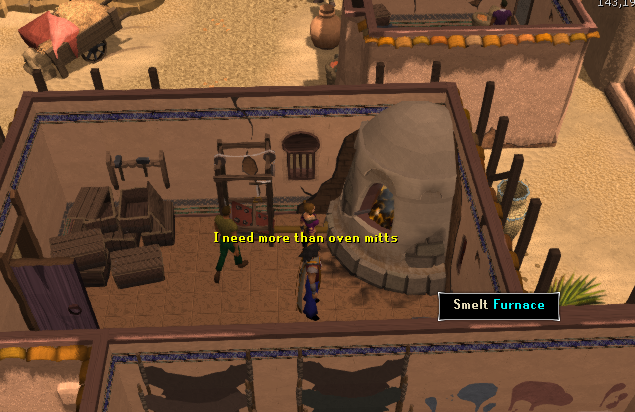 Usually Al Kharid is used by smithers because of the short distance between the bank and the furnace. You also might see people Runecrafting fire runes. The Al Kharid Castle is the home of the Al Kharid Soldiers. The castle is located in the center of the city right with a water fountain just outside in the courtyard. The castle has two floors in it. 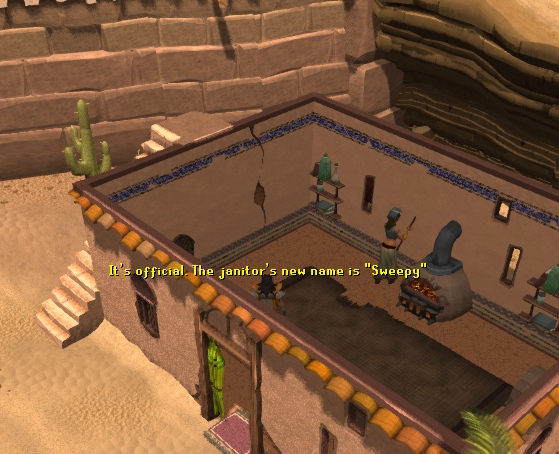 Inside the castle is Hassan, whom you have to talk to, to start the Prince Ali Rescue Quest. Wandering around, just outside of the palace is Osman. He also plays a part in the Prince Ali Rescue Quest, and if you're a member, you can begin the Sorceress' Garden Activity by speaking to him. First, we are going to take a look at the first floor of the castle. 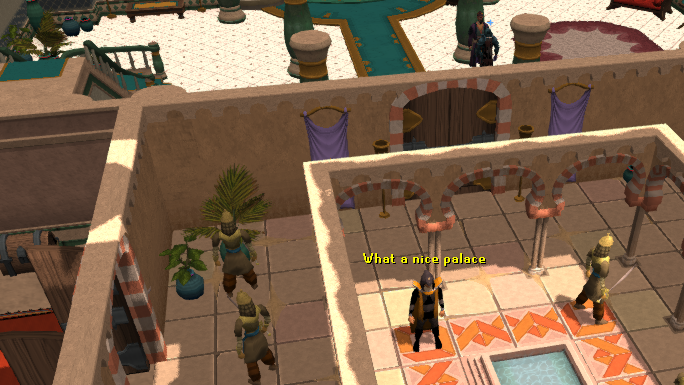 As you may have noticed Al Kharid Guards are everywhere. You can kill them, however if there is more than one near you, all nearby Al Kharid guards, which are level 9, will try to attack you. Members have a chance to pickpocket them if you have a thieving level of 25 and want to earn a little bit of money. You can gain 25 thieving XP. Inside the castle on the bottom floor is nothing much but tables and chairs. Once in a while a guard will walk in there, but it's usually quite empty. Well the top floor isn't that interesting either. You can find tables, that you can put items on. You can also go out on the balcony and see the courtyard below you. You can't see any of the players though, only the items that are on the ground will show up. Northwest of the bank you can a strong tree. You cannot cut this tree, but you can swing from it! If you have a Mithril grappling hook, then this attraction on the map is just the place for you. In the River Lum, there is a broken raft with a "grapple" option. You can swing yourself to the raft, and then swing the hook to one of the strong trees. 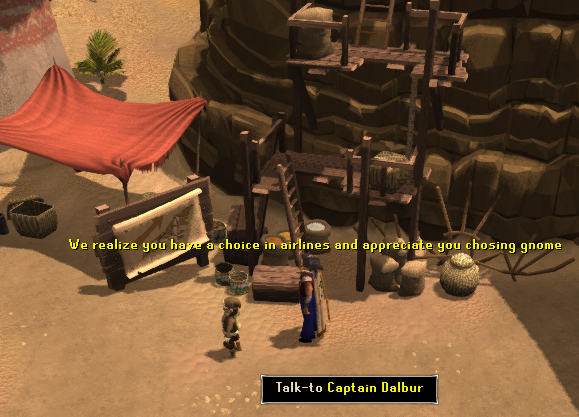 One way will take you to the Al-Kharid, and the other way is to the Lumbridge swamp. 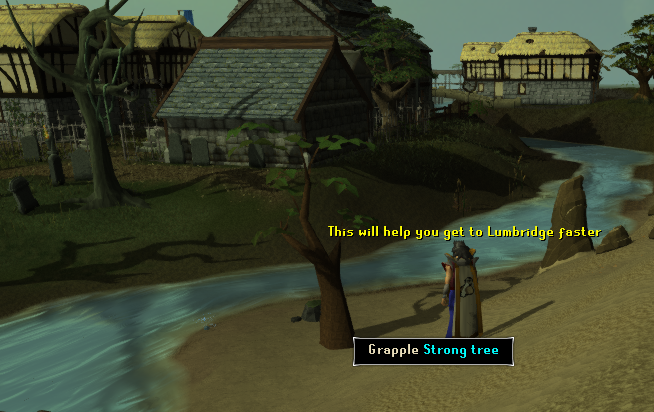 This shortcut requires a Mithril Grapple Hook, level 8 agility, and level 19 strength. Al Kharid is one of the best places to smelt ores. 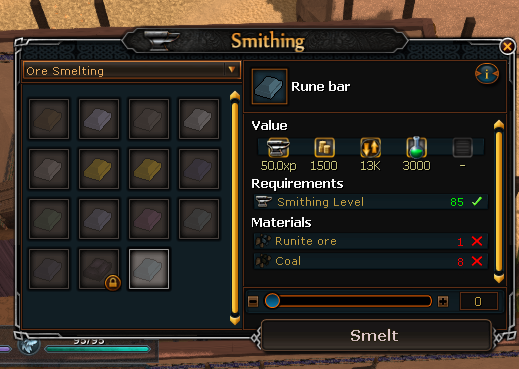 The bank is almost right next door and you can gain a lot of Smithing XP here. The majority of users here have banked massive amounts of ores, and use Al Kharid to smelt them. These are some of the bars you can come up with when smelting the correct ores together. In the room where the range is there is also a person selling Kebabs. They will sometimes heal your health but sometimes they knock a little HP off you. So if you are really low on HP I wouldn't take the risk. 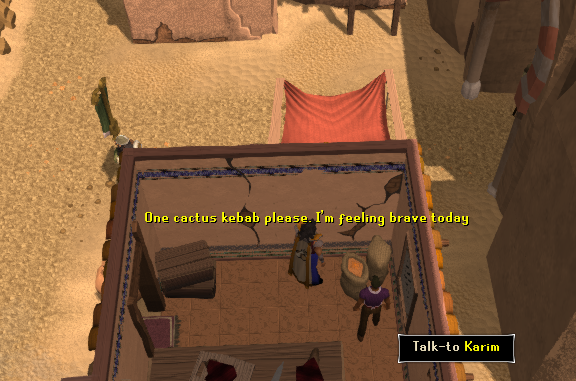 You can buy the kebabs for 1 gp. The kebab seller says he makes the best kebabs in the world! The building beside the Furnace is where you'll find the Tanner. He will exchange your regular Cow or Dragon hides for Leather of that type. Of course this costs money. Though the price depends on what type you get. Once you've completed the Grand Tree Quest you can ride these Gnome Gliders. This is one of the faster transportation because it sometimes can bring you to places where you can't teleport. South of the city is the entrance to Shantay Pass, your way to the desert. This desert is members only though. When entering the desert it is recommended to wear Desert Robes. 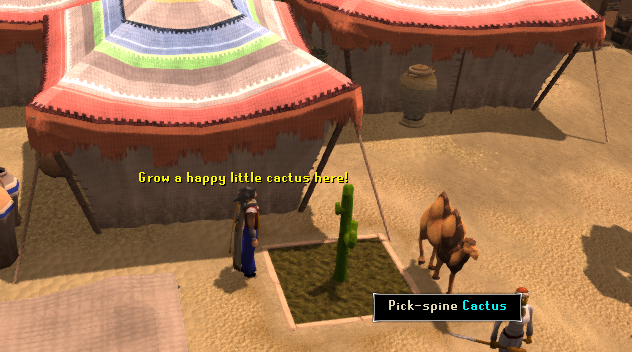 Right by the general store there is a farming patch which you can grow your cactus with cactus seeds. This requires level 55 Farming to do. You have to watch over your crops by yourself since there is no NPC to do it for you. 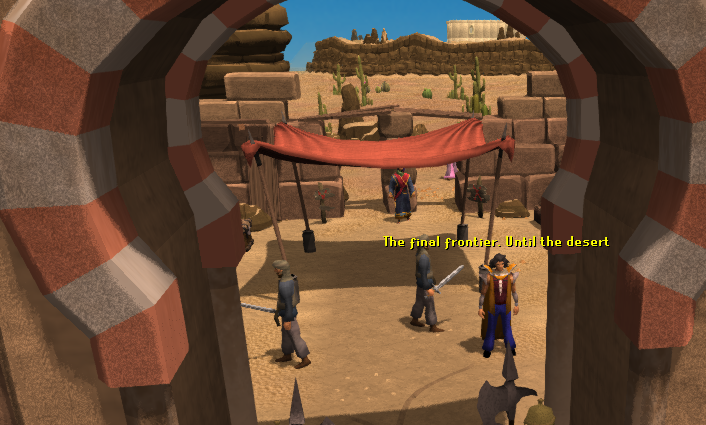 The Duel Arena can be found to the northeast of the city, right by the Fire Altar ruins. It is available to both Freeplayers and Members. You can duel other players here, as well as watch others dueling. The fun part is if you die you don't lose any of your items. Here there are nurses walking around that can heal you if you ask them to. 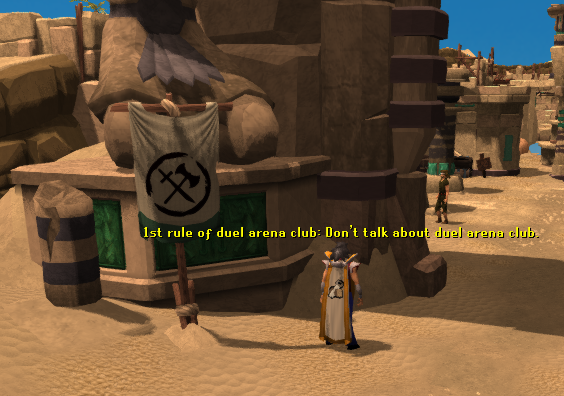 You will also respawn here when you finish dueling in the duel arena. If you were using prayer during your last duel there is an altar where you can recharge your prayer at. Right next to the hospital is a small bank which you can access by using the chest. This is helpful if you need to change weapons or get more food. One of the other member features is the Mage Training Arena. This is an Activity where you can earn Pizazz Points. There is an enchanters room, the Alchemist's Playground, and the Telekinetic Theatre. 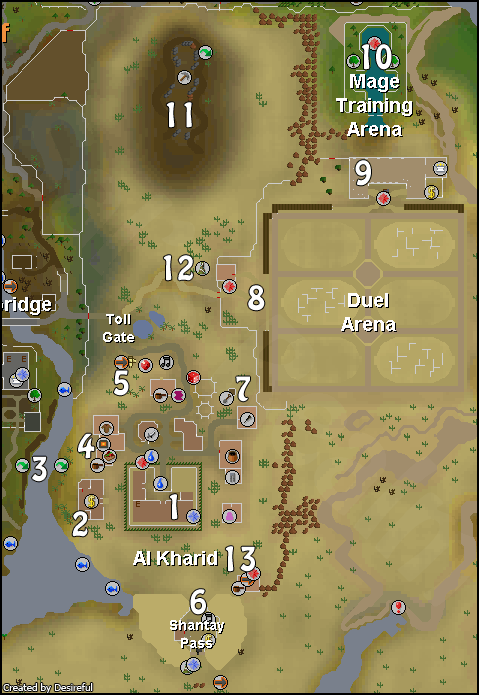 The Mines of Al Kharid are located north of the Duel Arena and west of the Fire Alter. 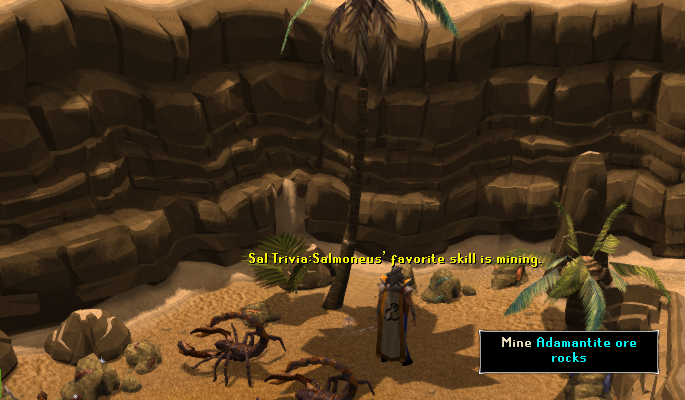 These mines are one of the best mining spots in Runescape! Inside, you'll find several level 14 Scorpions crawling around, so be careful if you're a lower level! If you go to the back of the mine, you will find a Water Rune spawn near the Adamantite Ore. Just to the bottom right of that next to the Iron Ore on the right hand side of the mine is a Fire Rune spawn. This mine is also good for training your Mage and Range skills, as you can stand on the top and fire down onto the Scorpions without them attacking back. 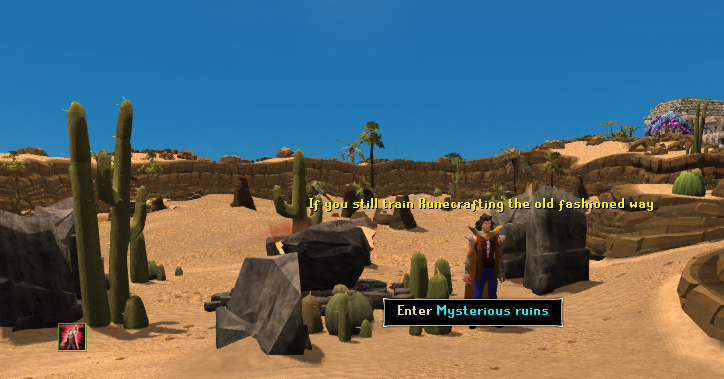 The ruins to the Fire Altar can be found even further north of the Farming Patch and right outside of the Duel Arena. 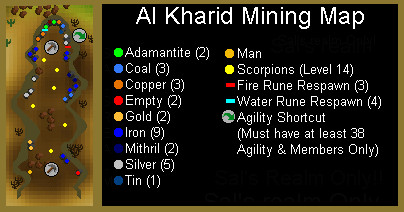 It is somewhat close to the Al Kharid Mine also. 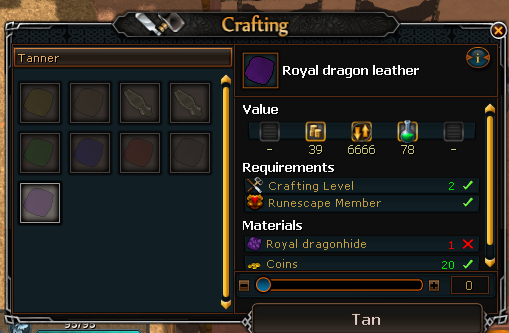 To make fire runes you must have at least level 14 Runecrafting. The Sorceress's House can be found southeast of the palace. On the lower floor, you can find the apprentice, who, once talken to, will teleport you to the sorceress's garden where you can play the Sorceress's Garden Activity (also known as "A Sq'irk A Day....") Upstairs, you can find the sorceress herself, who doesn't like intrusions; those who talk to her may just find themselves teleported out of the house. There are all sorts of shops here in Al Kharid, including Scimitars, Gems, Silk and Kebabs, Skirts, Legs, Crafting and a General Store. You can also find Ali Morrisane's little shop in this area. Ali Morrisane's shop can be found northeast of the Silk Trader. At first, he runs a small general store with little and pointless goods. 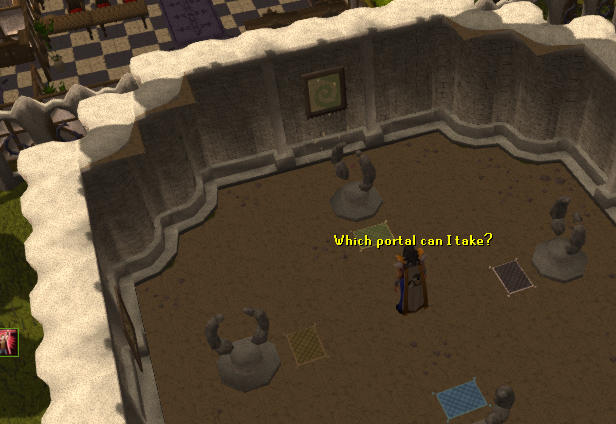 If you complete the quests Rune Mysteries and The Feud, then you can start the Rogue Trader Activity. 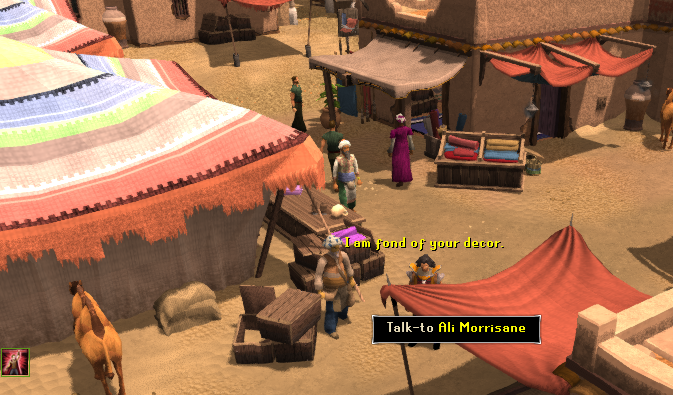 In this game, you go to different shops around Runescape and ask for their help to make Ali's business more successful. Once you complete this game, Ali will be able to sell you blackjacks, desert clothing, and a variety of runes. Please note that Ali's shop is for members only. More information about the items Ali sells can be found in the Rogue Trader Activity guide. 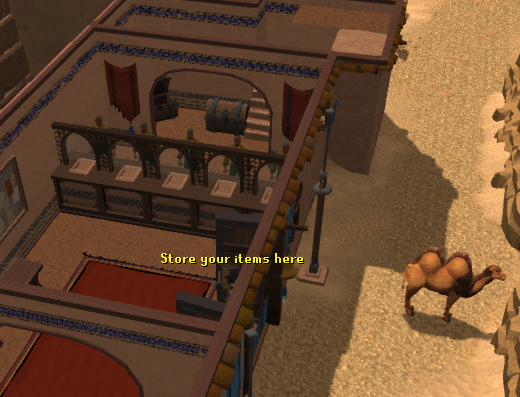 The Gem Shop located at the northern end of Al Kharid stock all sorts of gems, both uncut and cut. The only gems this shop doesn't sell is dragon stone and Onyx gems. South-East of the Gem Seller is the Silk Trader, who will sell you some fine Silk for 3gp each. If you tell him that it's too expensive, he'll sell you a piece for 2gp and no lower. The Scimitar Shop is east of the Kebab Seller offers Scimitars from Bronze to Mithril. At the crafting shop you can buy lots of items for the Crafting Skill. Some examples may be a chisel to cut your gems. You can also find moulds here that allow you to make rings and necklaces. 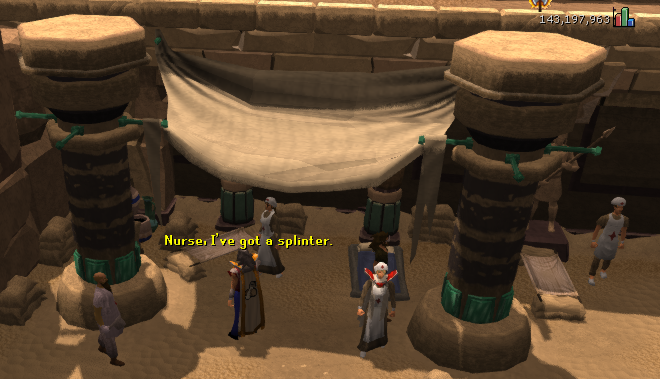 Sickle Moulds can only be bought by Members, and they're used in the Nature Spirit Quest. South of the Crafting Shop is the General Store, where you can buy the basic items you may need. This may include a pot to hold flour or a chisel to cut your gems. You can find other necessary items here too. Right next door to the General Store is a shop where you can buy plate legs, from Bronze to Adamant for a fairly good price. Further to the south is the Armored Skirt Shop, where you can by armored skirts from Bronze to Adamant.